Inner, Outer And Whole Unit Ab Training. Abs... everyone wants them, not many have them. Here I am going to introduce you to the full ab workout routine. With a balanced diet and this routine there is no reason you cannot get the abs you want. Abs... everyone wants them, not many have them. I am guessing you are reading this, with the hope that I am going to provide you an insight about obtaining a striking set of abs. Well you are absolutely right. Here is the information you need in one sentence: &apos;Strengthen up your midsection, but more importantly reduce your body fat through consistent progressive exercise and a well thought out diet that provides adequate nutrition but with a deficit of calories.&apos; It really is as simple as that. Simple but not easy! The Author&apos;s Abs (Courtesy Of Parham At LAmuscle.com). Having said that I can continue with presenting a midsection workout to aid in the development of your abs without the pretence that the ab workout in and by itself will give you the rippling midsection you covet. Your midsection is composed of a range of muscles that aid in movement and stabilization of your trunk. The muscles can be classified as either inner unit or outer unit muscles. The inner unit consists of the transverse abdominis (TVA), internal obliques and the multifidus as well as a few other smaller muscles. The role of the inner unit is to provide stabilization and support for the joints throughout the trunk. The outer unit comprises the muscles typically trained when doing Abs i.e the external obliques, rectus abdominis, erector spinae group and the quadratus lamborum. The vast majority of midsection exercises out there fall into the classification of either inner unit exercises or outer unit exercises. However for a truly strong midsection you want exercises that force both inner unit muscles and outer unit muscles to coordinate and become a functioning team for torso strength. Considering this I will first present the more common exercises for both the inner unit and outer unit followed by three whole unit exercises that train virtually the whole of your midsection. This exercise will strengthen your TVA through it working to stabilize the spine and maintain intra-abdominal pressure. To perform a prone bridge, kneel down resting upon your forearms and knees. Draw your stomach in and up while keeping your back flat, then hold this position for thirty to sixty seconds. Ensure you don&apos;t flex or extend your spine, but rather hold a neutral spine position throughout. You should feel a burning sensation deep in your stomach, this indicates you are doing the exercise correctly and working the correct muscle. Once you can do ninety seconds perform the exercise off your forearms and toes, so there is a straight line formed from your body running from your shoulders down to your feet. 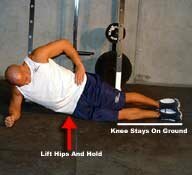 To make the exercise harder still you can decrease the base or points of support. Try to hold the same position but raise one foot of the ground. If you can do this, raise one foot and the opposite arm so you&apos;re only resting on diagonal opposite arm and leg. This is performed with as the plank above but rather than resting on your arms face down you turn so you are supported on the side of one foot and one arm facing to the side. The easier version of this exercise is to rest on your forearm and by bending your legs to ninety degrees resting on the side of your knee. As well as working your TVA this will bring in your Quadratus laborum and obliques. To perform the Ab curl (crunch) lay face up on a mat with your knees bent and feet flat on the floor. To reduce the stress on your neck, pick a point on the ceiling and stare at it though out the exercise. The easiest position has your arms straight and your hands on your thighs. Begin by bringing your shoulders and upper body off of the ground to the highest point before your lower back comes of the ground (around thirty degrees of flexion), pause and slowly lower back down. Repeat. <> To make the exercise more demanding start to bring your arms further towards your head to increase the mechanical loading on the stomach. Either hands across your chest, hands by the side of your head, or arms extended beyond your head with your arms in line with your ears. These are the choices before you have to add weight to increase the intensity. 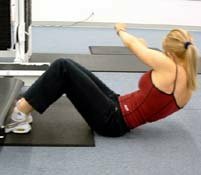 To perform a back extension, lay prone (face down) on a mat. The easiest position is to keep your hands by your sides, which will decrease the mechanical loading to the lower back musculature. Rotate your arms so that your palms are facing the ground, this will cause a slight amount of scapula retraction and put you in the correct position. Keeping your head in a fixed neutral position throughout so you&apos;re looking at the mat and don&apos;t put unnecessary strain to your neck. Raise your chest and shoulders off the ground so you&apos;re extending your lower back to around thirty degrees. Lower and repeat. Just like the ab curl, change the hand position so your arms are further towards or beyond your head. This will increase the mechanical loading. This exercise is very similar to the ab curl, however, instead of just curling up you rotate slightly and bring just one shoulder off the ground and bring your shoulder towards the opposite knee. Often individuals forget that the shoulder is where the movement should come from and will just bring their elbows towards the opposite knee for maximal oblique stimulation. Don&apos;t be one of those individuals. Focus on bringing the shoulder up and across. The following whole unit exercises are demanding and definitely fall into the advanced category. To ensure you have the prerequisite strength I suggest trying this little test. Lay supine (face up) on an exercise mat without crossing your feet, raise your legs up so there&apos;s a ninety degree angle at your hips. While lying in this position activate your TVA by tensing your stomach so your lower back presses down on the mat and your spine flattens out from its normal arch. Put your hand on the mat so you can feel your lower back and ensure its touching the ground. If you can get your hand between the mat and your lower back you&apos;re not activating your TVA. Keeping your legs straight slowly lower them to the ground, if at any point your lower back comes off the ground you are not strong enough to perform the next series of exercises. For those of you who can virtually lower your legs to the ground while keeping your lower back depressed, read on. You&apos;re Not Activating Your TVA. This movement calls for simultaneous spine flexion and rotation as well as hip flexion and a whole lot of stabilization to boot. Lay supine on a mat with your legs out straight. Simultaneously sit up and rotate to one side as well as hip flexing the opposite leg so you bring the contra-lateral knee toward the side your rotating. What you end up doing is a sit-up with extra oblique and hip flexor work, but because of the stabilization required your TVA should work overtime. To get into the start position get down into a press up position with your arms full extended. Keep your stomach tense throughout to maintain a neutral spine position. Simultaneously raise one arm and the diagonally opposite leg until they are in line with your body. Lower and repeat. The key to this exercise is to keep your back in a neutral position and avoid any rotation. You should be able to rest a broomstick on your back throughout without it falling off and maintaining contact with your hips, mid back and the back of your head. This will ensure you&apos;r maintaining the correct anatomical position throughout. You can either do all the reps for one side first or alternate side&apos;s rep for rep. This exercise is a killer for your obliques when done properly. Start off in a sit up position, fully complete. Keeping your midsection tight and spine in a neutral position sit back until your upper body is at a forty-five degree angle from the ground. This is the start position. Extend your arms straight out so they are in line with your chest. Maintaining the position above, rotate your upper body at the waist so you are facing side on, slowly rotate back and go the opposite direction. If this is easy hold on to a small dumbbell or weight plate. There you have it, a balanced whole unit ab training session. If you&apos;re unused to these exercises, add them into your usual ab workout slowly. Hopefully between these and a good diet you&apos;ll get the abs you desire. Gled Danbury is a competitive bodybuilder in Europe that has been bodybuilding for over 5 years!